I happened to find this gorgeous thing in a bookstore just before departing for New Orleans, and bought it as my guidebook for the trip. 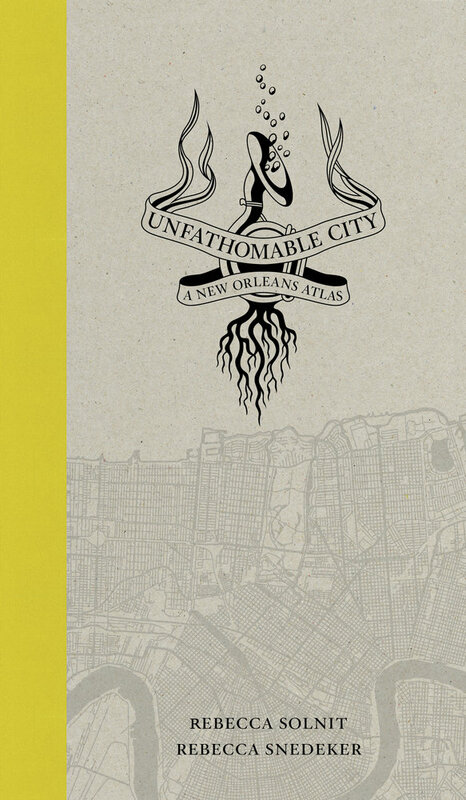 It’s much more than a guidebook, more like a collection of essays about New Orleans, but there are beautifully executed infographic maps, and a list of 25 points of interest–including the statue of Ignatius P. Reilly, a Banksy mural and an Louise Bourgeois spider—and it was a surprisingly complete companion. The experience made me hopeful that perhaps now that the nuts-and-bolts of restaurant-and-hotel recommendations are being taken care of online, there will become a market for eccentric, meaningful compilations of information about cities, that will be used by travelers as the guidebook used to be. Solnit is a San Francisco native who has written a memoir and a previous creative atlas for SF. Snedeker is a filmmaker from New Orleans. Together, and with collaborators and contributors, they cover pretty much everything I’d want to know about the city: how it came into being, who lives there, what the fate of the native people in the region has been, some ills (the oil industry, prisons), civil rights history, culture maps (music, carnival), and of course, a map of the flooding. The book is fairly liberal-ideological, which might bother some people, and I was aware in some sections of getting only one side of a story—particularly with regards to the unchecked anti-corporatism (a trait I have been known to share, but I try to be self-aware about it), and selective visibility when it came to the poor. But considering that every guidebook has an ideology, I didn’t begrudge the authors theirs, and I greatly enjoyed their company while in New Orleans.